Captions: Diane Graebner�s Autumn Outing captures the Amish mode of transportation and the beauty of the area during Fall�s glorious color change, which presages the coming starkness of winter. Slightly farther away than the other historic sites featured here is Ohio�s Amish country, which is centered in Wayne, Holmes, and Tuscarawas counties. Here you will find the largest concentration of Amish in the World, along with large communities of Mennonites and Swiss, whose histories are closely inter-related. The Amish originally were Mennonites, but broke away from the earlier group due to religious differences. The founder of the Amish was Jakob Amman, a Mennonite bishop in Switzerland. Amman urged his followers to dedicate themselves to living a Godly lifestyle. In Amish Country you will find numerous historical museums, markers, and structures � and several scenic byways � as well as many craft and gift shops and furniture stores for which the area is justly famous. Don�t miss the extraordinary Lehman's Hardware Store in Kidron, or Christopher David & Graebner Galleries in Millersburg. The latter facility was started by renown artist, Diane Graebner to showcase her own work. Today it is owned by Angie Fry and Marie White, and in addition to Diane Graebner, represents sixty area artists. 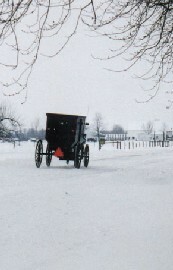 Amish Country is a beautiful day trip back into time � to a time of horse and buggy and kerosene lanterns. Combine it with a stop at David Zeisberger�s Schoenbrunn Village, the first �European� settlement in Ohio, which you will pass as you enter Amish Country. As you travel the roads in Holmes and Wayne County, be alert for horses, buggies, and persons riding bicycles along the side of the road. During harvest months, road-side stands with fresh, home-grown produce will be found at many intersections.